Willis Tower, formerly named Sears Tower, is a 108-story, 1451-foot (442 m) skyscraper in Chicago, Illinois. At the time of its completion in 1974, it was the tallest building in the world, surpassing the World Trade Center towers in New York. Currently, Willis Tower is the tallest building in the United States and the fifth-tallest freestanding structure in the world as well as the fifth tallest building in the world to the roof. Although Sears' naming rights expired in 2003, the building continued to be called Sears Tower for several years. In March 2009 London-based insurance broker Willis Group Holdings, Ltd., agreed to lease a portion of the building and obtained the building's naming rights as part of the agreement. 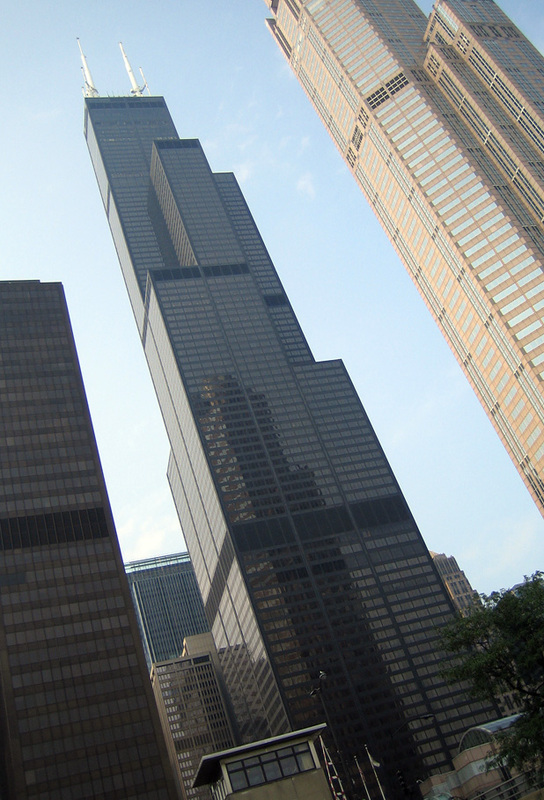 On July 16, 2009, at 10:00 am Central Time, the building was officially renamed Willis Tower. In 1969, Sears, Roebuck & Co. was the largest retailer in the world, with approximately 350,000 employees. Sears executives decided to consolidate the thousands of employees in offices distributed throughout the Chicago area into one building on the western edge of Chicago's Loop.